Beast Pre-release Breakup Song "No More"
Ahead of their upcoming mini-album Good Luck, Beast has pre-released the mid-tempo ballad “No More.” The track details the aftermath of a breakup as the singer wishes for the other person to move on. It easily fits into Beast’s musical repertoire and highlights the members’ harmonious voices. The music video for “No More” is a work of art that seamlessly blends social media with the typical sad love story that usually accompanies these types of ballads. Using Instagram reborn as Beastagram, the story is told mostly through split screens. Junhyung and actress Lee Yoo-bi star as the main couple. The MV begins as Yoo-bi scrolls through Beastagram with the members’ photos doubling as their singing appearances. The editing is smooth and continuous, an indicator of how well-cut the music video is. Through Beastagram, we get glimpses of Yoo-bi and Junhyung’s relationship as it changes from cute to melancholy. 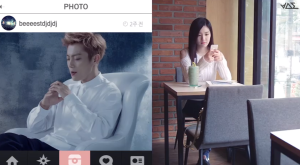 Although the breakup isn’t shown until later in the MV, the pain on Yoo-bi’s face when Junhyung likes one of her photos is evidence of the breakup. 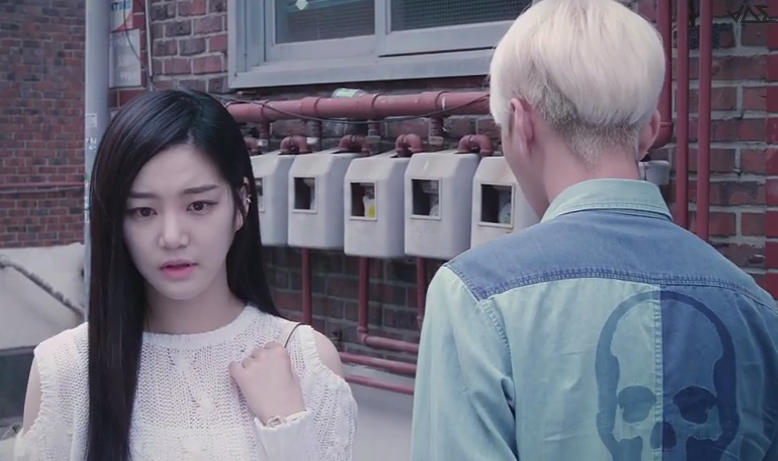 This ties into the lyrics as it brings back the feelings Yoo-bi thought had dissipated. The technologically driven generations of today can definitely relate to this as the use of social media has become pervasive. Even the mere glimpse of an ex when scrolling through Instagram can bring feelings rushing back. The MV plays with this theme as we finally get to see Junhyung’s side of the story. He also reminisces about the relationship, even though later scenes show that he has moved on. The split screen of the music video allows the viewer to follow both Yoo-bi and Junhyung as they travel around town and finally run into each other. “No More” is an enjoyable music video. It captures the sentiments of breaking up in the age of social media without going overboard. The strength of the music video lies in its strong cinematography and editing. The incorporation of the lyrics into the storyline was also done well. The only complaint I have is the members’ styling. Kikwang’s boots were out of place while the make-up around Hyunseung’s eyes was overdone. I know he was supposed to look like he had been crying, but it was heavy-handed. Still, these are the only complaints I have about the music video, and their scenes were so few that it’s minor. As for the song itself, “No More” is Beast at their best. While Beast’s high energy dance songs are always fun, they excel at mid-tempo ballads, and “No More” is proof of that. The music takes the backseat, allowing the members’ voices to shine. This is especially evident when Yoseob and Dongwoon harmonize towards the end of the song. “No More” also highlights Junhyung’s strengths. His flow was smooth, and there was just the right amount of pain in his voice for the mellow verse. Junhyung’s raps are typically stronger when they’re toned down as opposed to faster paced songs when he can come across as if he is trying too hard. As a a pre-release track, “No More” serves as a taste of Beast’s upcoming album, and it doesn’t disappoint. It reminds me a bit of “How to Love” and seems to hint at growth from their last mini-album, Hard to Love, How to Love. Beast is one of the few groups that has demonstrated a consistent musical evolution, and “No More” suggests that a more mature sound with greater incorporation of traditional instruments will be featured throughout the upcoming album. Overall, “No More” is a strong music video that showcases Beast’s unique style and melodic voices while still keeping the viewer entertained. The concept was different and well-executed. If their pre-release MV and song were this good, I can’t wait to see how the rest of the album is.